We do not use pre-fab kits. All of our sheds are custom-built from scratch on your property and built to order. Our team arrives first thing in the morning with raw materials – lumber, siding, windows, doors, and everything needed for construction. Our staff have significant experience and expertise because this is what we do – all day, every day. 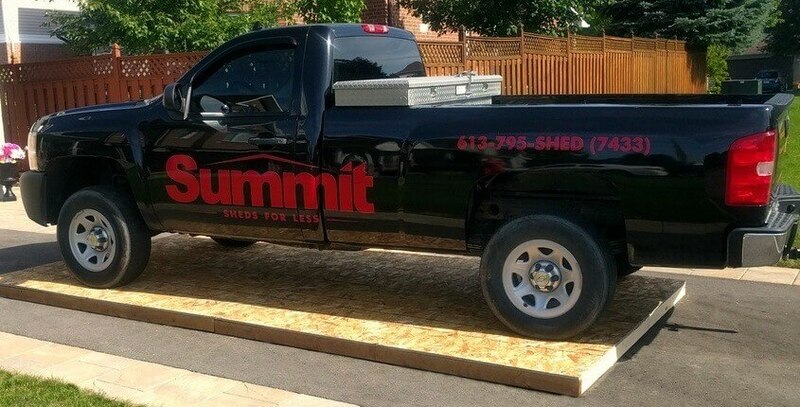 When you order a Summit shed, you can do so with confidence, knowing that it’s our staff that will be building for you, as this allows us to uphold the high quality standards that have earned us our reputation. 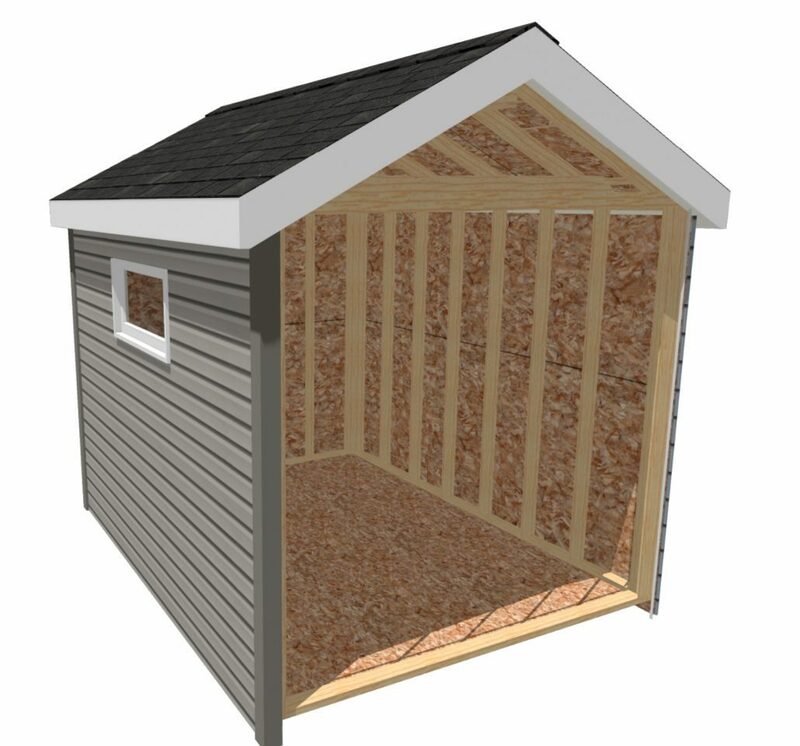 You need only to read our reviews to know that our sheds are high-quality and built to withstand Ottawa winters. Everything we build is constructed to comply with the Ontario building code and we hand-pick our building materials to make sure that our clients receive only the best. Most often, people ask if our shed base is strong, so we decided to put it to the test! We built a base and floor, identical to what we build for each of our sheds, and we parked one of our Chev pick up trucks on it over a long weekend. Here’s a picture of it after 3 days of 5,000 pounds of steel – perfect and standing strong! What’s Included with Your Shed? 2×4 joists, 16″ on centre. Built on patio stones and pressure-treated 4×4’s to lift the shed off the ground. Built from raw materials on your property, the majority of our sheds require only one day of construction. 5/8″ tongue and groove OSB; plywood and pressure-treated plywood are available as an upgrade. 7′ walls, rather than the standard 6′ walls, with approximately 9′ at the roof peak. Higher walls are also an option. Choose from maintenance-free vinyl siding, cedar or smart panel (manufactured wood siding). 1 or 2 stationary, 17″w x 35″h (based on shed size); glass/white vinyl frame, with or without grills. Other sizes and styles are available. A single wooden door, with hardware that accepts a padlock. Upgrade to one of our many door styles and sizes. Architectural asphalt shingles. Premium colours and metal roofing are available as upgrades. Aluminum fascia and drip edge around the roof perimeter. Choose from white, black or granite; premium colours available. The shed is leveled to the highest point on which it will sit. Free delivery within Ottawa. 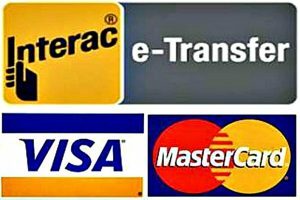 A surcharge applies for travel outside of Ottawa, based on distance from Bank/Hunt Club. A 3-year, bumper-to-bumper warranty on materials and workmanship. Exterior finishes have extended warranties. We leave your property the way that we found it. All building debris is removed and everything is cleaned up before we leave. Garden Sheds. Storage sheds. Vinyl Sheds. Shed Builder. Garden Sheds. Storage sheds. Vinyl Sheds. Shed Builder. Garden Sheds. Storage sheds. Vinyl Sheds. Shed Builder. We have many available options to address your unique needs and personalize the look of your project. From a variety of finishes, in a broad array of colours, to different sizes and styles of doors and windows, to vented soffits, roof vents, ramps, window boxes, dividing walls, skirting, shutters and the list goes on. And if you don’t see what you’re looking for, we’ll do our best to find it for you.